Savor the tastes of succulent fruits and robust vegetables no matter the season by preserving them. Featuring simple, fast recipes with mouthwatering photos to match, Canning & Fermenting includes everything the beginner needs to get started. 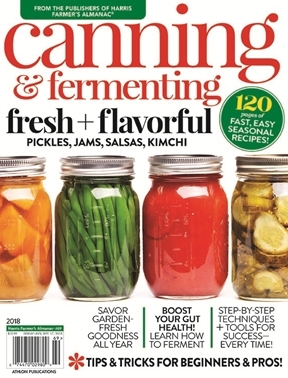 Inside you’ll discover the differences between canning and fermentation, the basic ingredients necessary for both, all the tools of the trade, step-by-step instructions and helpful suggestions to ensure safe, optimal results every time. The 60+ fresh and flavorful small-batch recipes are grouped by season to celebrate nature’s endless bounty.